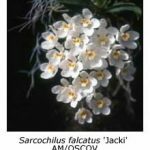 Those new to orchids usually prefer to grow hybrids at first, partly because they find their names less confusing than those of species orchids. The name of every species orchid is made up of two terms, the first being a noun describing the genus (which is simply a collective name for a group of similar objects). The second term (known as the species epithet) is an adjective that describes a particular species more fully. Both terms always have Latin endings, even though in some cases the words themselves are not Latin but derived from the Greek, English or some other language. The genus term may be purely descriptive, as in Phalaenopsis, which is derived from the Greek phalaina (moth) and opsis (appearance of). But in other cases the genus term may be derived from the name of a person, as in Cattleya, named after Mr. Cattley, grower of the first member of the genus to flower in Britain (in 1818). Another example is the genus Lycaste, named after Lycaste, the beautiful daughter of Priam, last king of Troy. Similarly, the species epithet may be purely descriptive or it may commemorate a person or perhaps the place where that species was first found. In the case of species epithets, there is a further complication, because Latin adjectives have different endings, depending upon the noun to which they apply. 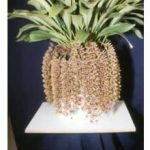 Examples such as Sarcochilus falcatus, Epidendrum falcatum and Neofinetia falcata are easy to understand, but you need to be a Latin scholar to understand why Cymbidium suave and Trichopilia suavis are also correctly named. 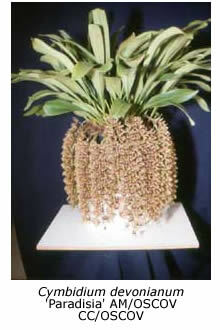 Examples of species epithets that commemorate people are Bifrenaria harrisoniae, Coelogyme dayanum and Cymbidium devonianum (named after Mrs. Harrison of Liverpool, John Day of London and the sixth Duke of Devonshire, all prominent 19th century amateur orchid growers) and Cymbidium lowianum, Masdevallia veitchiana and Paphiopedilum sanderianum, named after Hugh Low, James Veitch and Frederick Sander, three nurserymen who were also well known in the 1800s. 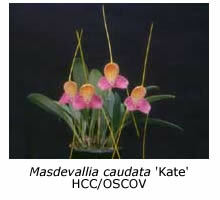 The epithets of species orchids named after their place of discovery always end in ense or ensis (meaning from). 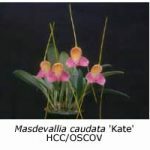 Examples are Paphiopedilum malipoense (named after the province of Malipo in China), Masdevallia tovarensis (named after the town of Tovar in Venezuela) and Paphiopedilum philippinensis (from the Philippines). Congratulations to those who have read this far, especially if you understand more now than when you started! 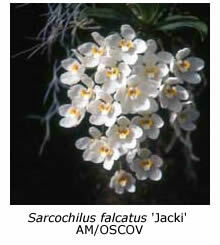 Actually the names of species orchids are no more difficult to remember than those of people – the main difference being that the surname (genus) of the orchid comes first and its given name (species epithet) comes second. Just imagine that they’re Roman citizens (with Latin names) and you’ll have no trouble at all! Unfortunately, that advice is useless to me – I can seldom remember the names of people to whom I’m introduced and sometimes I have difficulty in recalling the names of friends I’ve known for years!